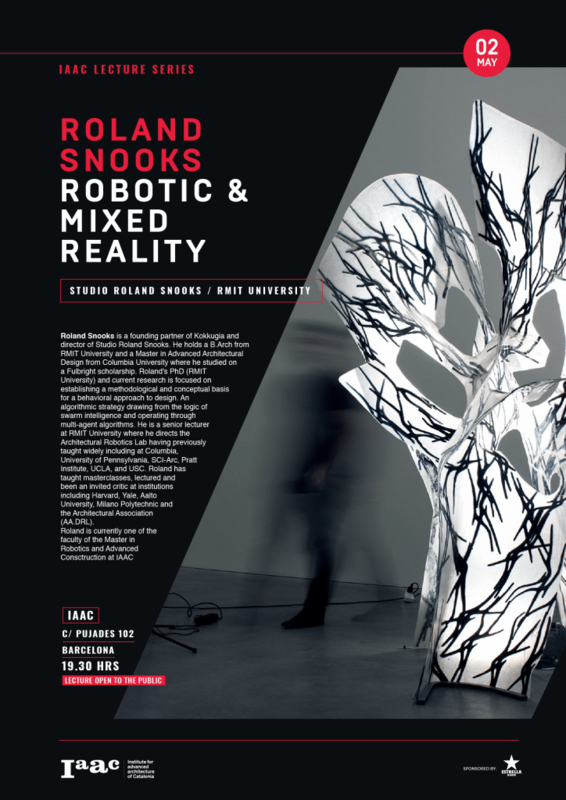 Roland Snooks is a founding partner of Kokkugia and director of Studio Roland Snooks. He holds a B.Arch from RMIT University and a Master in Advanced Architectural Design from Columbia University where he studied on a Fulbright scholarship. Roland’s PhD (RMIT University) and current research is focused on establishing a methodological and conceptual basis for a behavioral approach to design. An algorithmic strategy drawing from the logic of swarm intelligence and operating through multi-agent algorithms. He is a senior lecturer at RMIT University where he directs the Architectural Robotics Lab having previously taught widely including at Columbia, University of Pennsylvania, SCI-Arc, Pratt Institute, UCLA, and USC. Roland has taught masterclasses, lectured and been an invited critic at institutions including Harvard, Yale, Aalto University, Milano Polytechnic and the Architectural Association (AA.DRL). Roland is part of IAAC Master in Robotics and Advanced Construction Faculty.